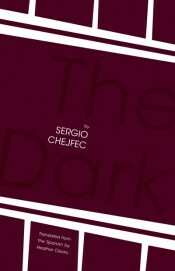 Early in Sergio Chejfec’s The Dark, the nameless narrator describes his disorientation when looking over a landscape as “the vertigo of simple things.” This phrase describes the experience of reading Chejfec’s novel, an interior monologue by the reclusive narrator. He remembers his affair with Delia, a young factory worker whom he abandons after she becomes pregnant. His search for meaning leads him to interrogate his memories: “I always felt as though I occupied a place on the outside, that my role was to register things and to draw conclusions from what I saw, whatever the circumstance.” He analyzes fragments of the past as an archaeologist. However, he is the most unreliable of narrators, specializing in indirection, circling around difficult memories only to be deflected into abstraction. The narrator devotes special attention to Delia’s job in the factory and her social status in the working class. He remembers watching Delia and her fellow workers from afar, marveling at their appearance as a collective entity, describing them as a “herd.” He applauds Delia’s ability to subordinate herself to machines, the commodities she produces, and the collective she creates with her fellow workers. In the end, he is attracted to Delia in part because of her identity as a factory worker; her later combined identity as a mother and a factory worker threatens his sense of her and of himself. Why, in spite of these difficulties, does the narrator interrogate his past? One clue may be held in the novel’s title. Remembering the early stages of their relationships, the narrator recollects, “If there is beauty in the world, Delia and I thought, if something moves us to the point we are unable to breathe; if something presses our recollections to the very limits of memory, so they can never be as they were, that something lives in darkness and only rarely makes itself known.” These moments, when Chejfec combines exquisite prose with the human yearning for truth and beauty, keep us reading, weighing the novel’s contradictions, sifting through the narrator’s abstract reflections in search of his life’s meaning.